FILE - A newspaper vendor rides his bicycle on a smoggy morning in New Delhi, India, Dec. 1, 2015. Bike-sharing systems in the southern city of Mysuru and the central city of Bhopal, both launched last June, have met with a tremendous response, officials say. About half a dozen more cities, including Bengaluru, Pune and Bhubaneswar, are now drawing up similar plans, according to the World Resources Institute (WRI), a Washington D.C.-based research organization. "Bike sharing is a viable option for Indian cities — we just need good-quality bikes, dedicated lanes and a system that is efficient," said Chandramauli Shukla, chief executive of Bhopal Smart City Corporation. The corporation implements the federally-funded Smart Cities program to improve services like internet connectivity and public transport in 100 cities across India. FILE - Vehicles move slowly at a traffic intersection in New Delhi, India, Jan. 16, 2016. 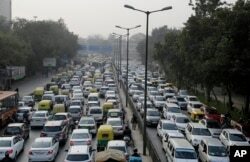 Vehicle emissions account for almost a third of air pollution in India, which has nearly half the world's 20 most polluted cities, according to the World Health Organization. Mysuru, close to the technology hub of Bengaluru, was the first to introduce a bike-sharing program, with the state's chief minister riding a yellow Trin Trin bike at the launch. The city now has 11 kilometers (6.8 miles) of dedicated bike lanes, according to WRI, which provided technical expertise to the Bhopal Municipal Corporation on the bike-sharing system. "In India, people look down on those who bike. So we had to show this is cool, with good-quality bikes and a mobile app to register and unlock bikes," he said. "But the main priority is safety, with dedicated bike lanes. That has encouraged people to give it a go," he told Reuters. 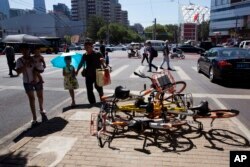 FILE - People walk past bikes from bike-sharing companies thrown in a pile at a traffic junction in Beijing, China, Aug. 4, 2017.